The bells were rung at the National Cathedral and millions of Americans tuned in to see the funeral in honor of the recently deceased President George H.W. Bush. Among the private funeral attendees were all of the former Presidents and First Ladies since George H.W. Bush. In fact, the presidents sat with their wives in a front row in the order they were elected. 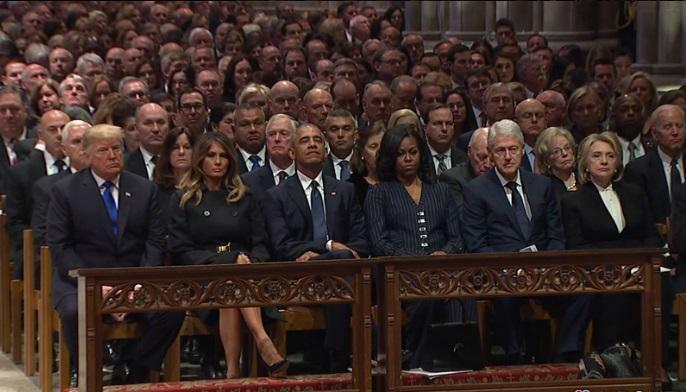 The Clintons, the Obamas, and the current President and First lady were all seated next to each other in what ended up being a dignified display of their ability to rise above conflict and unite in a common purpose of honoring the late President George H.W. Bush. The 41st president's funeral took place Wednesday and the day was marked as a national day of mourning in honor of Bush senior. This means that federal offices including the United States Post Office did not operate Wednesday to observe the day of mourning. The current President, Donald J. Trump, tweeted about his predecessor's passing saying, "Looking forward to being with the Bush family. This is not a funeral, this is a day of celebration for a great man who has led a long and distinguished life. He will be missed!" Services for the late President have been happening all week with the official funeral taking place Wednesday in Washington D.C. at the National Cathedral. The funeral began at 11 a.m. EST and every living president was present. World leaders including German Chancellor Angela Merkel, Jordan's King Abdullah II and the Prince of Wales were also expected to attend. George W. Bush, the son of the deceased, delivered a eulogy at the funeral as well as several others including former Canadian Prime Minister Brian Mulroney, former Senator Alan Simpson, and even Bush's biographer, Jon Meacham. Upon his arrival, the younger Bush shook the hands of the President and the First Lady as well as all of the previous Presidents and First Ladies, but when he shook Michelle Obama's hand, the internet couldn't help but point out that he had handed her something. It was somewhat of an inside joke as previously he had handed Michelle Obama a cough drop at the September funeral for Sen. John McCain. The internet speculated about whether it was a candy, or a mint, or perhaps even another cough drop. Regardless of what he handed her, it was enough to show that the younger Bush was still able to maintain a sense of humor despite the tragic circumstances. The stunt prompted a stiff and uncomfortable response from former President Barrack Obama. George Herbert Walker Bush was the last U.S. President to have served in World War II and was well-respected throughout his lengthy military and political careers. If you are interested in viewing more of the service you can view NBC's live stream which was uploaded to YouTube. I see 2 black men sitting next to FLOTUS? The more feminine one on the left looks familiar but cannot place him at the moment. Hillary looks like she hasn't slept for a hundred years. Obama has to keep reminding himself to hold his head up high. Michael knows what's coming. Bill cant hear a damn thing anymore and has no idea what's going on. Our POTUS and gracious FLOTUS show solemn knowledge of what must be done. OBAMA-SMUG DEFIANCE, DESPITE THE LIGHT HAS BEEN CAST ON HIS SIN. BILL-PRETEND TO BE INTERESTED AND BE INVISIBLE. HILLARY-SOMDAY THAT WILL BE ME LAYING UP THERE, AND I DIDNT GET TO BE PRESIDENT. BASTARDS!! !